Journeys across Karnataka: What to see in Bagalkot district? What to see in Bagalkot district? Bagalkot district came into being in 1997, it was part of Bijapur district until then. It consists of six taluqas namely Badami, Bagalkote, Bilagi, Hunagund, Jamakhandi and Mudhol. Bagalkote literally means 'door fort'. However, stone inscriptions identify Bagadige as the ancient name of Bagalkote. Three major rivers - Ghataprabha, Malaprabha and Krishna flow through the district. While Ghataprabha merges into Krishna near Alamatti village, Malaprabha merges into Krishna at Koodalasangama - the place where Jagatjyoti Basaveshwara attained Samadhi. The original Bagalkot town remains in the waters of Almatti dam reservoir; a new city was formed to accommodate the population. Bagalkot district's economy is mostly driven by agriculture and sugar mills. In the past decade or so, wind power generation is a growing industry. Agriculturists mainly grow cash crops like sugarcane, cotton, maize, sunflower and pulses. Farmers depending on rains grow traditional crops like jowar and togari. On the horticulture side, grape vines are popular. Bagalakote district was the seat of Chalukyan empire and holds some of the most important historical monuments of those times. The Greek astronomer Ptolemy previously identified many towns in the district of Bagalkote. Pattadakal was referred to as Petrigal, while Badami was known as Badiamaioi. For a tourist with passion for history, Bagalkote district is an ideal destination. 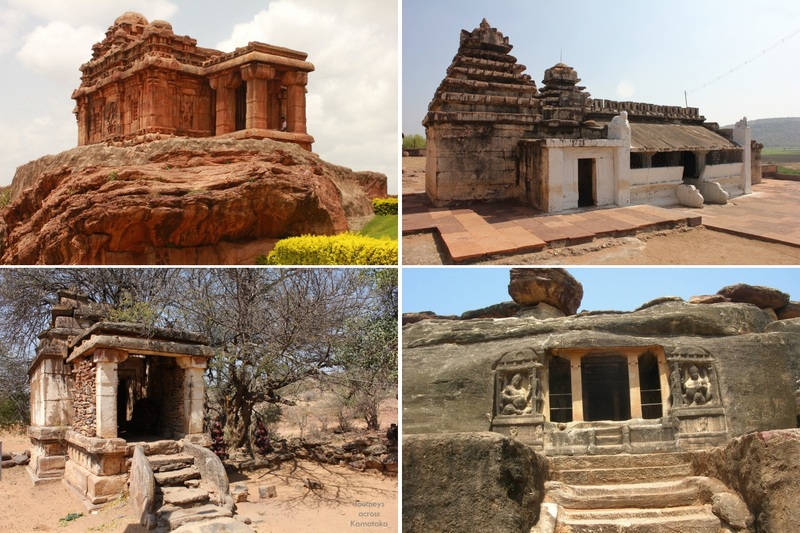 Besides the popular spots like Aihole, Pattadakal and Badami, one gets to see the rock hills with amazing rock formations, prehistoric caves, rock paintings, megalithic tombs. rock-cut temples, many more Chalukyan temples, forts, a king's palace and an elephant tomb also. One can easily spend weeks touring this little district. Here's what you can see. In the pictures below, the captions go clock-wise, starting at north-west. Bhootnath group of temples at Badami, Galaganatha Temple Complex. 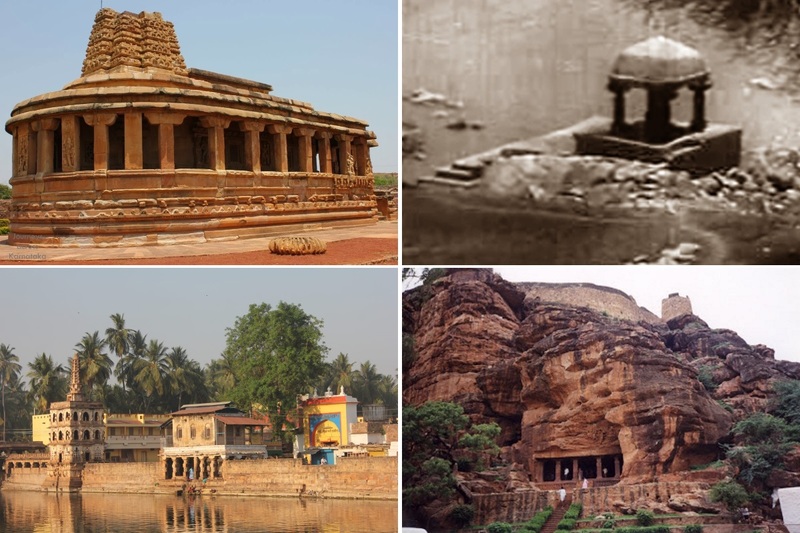 Badami - the capital of Chalukya Empire; formerly known as Vatapi. The historic town is situated next to the rock hill known locally as Hiregudda. In fact the town itself has roots in the hill. 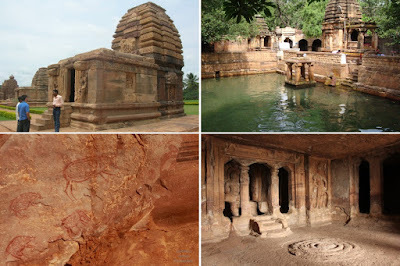 Badami is known for its cave temples, fort, a water tank and ancient temples. The cave temples were created by Buddhist and Jaina monks. Temples like Malgitti Shivalaya, Bhootnath temple complex, Dattatreya temple, Agasthya Theertha were created by the Chalukyan kings. Badami fort was originally built by Chalukyas was later improvised by Hyder and Tipu. The government museum here has an interesting collection of ancient sculptures including the rare Lajja Gowri. Close to the museum, on the hill's rocks are inscriptions from Chalukyan times such as Kappe Arabhatta Lipi. Also above the cave temples, on the hill, is another rock-cut shrine with images of Suryanarayana and an inscription in Devnagari script. Banashankari - about 4 kilometers south of Badami is this ancient shrine dedicated to Shakambari. The temple was built during Chalukyan times has a Pushkarni (water tank with shelter around it ) and Deepa Mantapa (a lamp tower). The temple is popular and holds an annual fair during the month of January on a full moon day. The temple's wooden chariot with stone wheels is atleast 165 years old. Guddada Ranganathaswami Temple - this is another ancient temple situated in a cleft in the rock hill. The spot is between Badami and Banashankari. Close to it on a rick face is a prehistoric rock painting. Naganatha temple - a Chalukyan temple situated in a cleft of Hiregudda. The spot is popularly known as Naganathakolla. The temple is simple yet beautiful and the spot is absolutely peaceful. Sidlapadi Cave - a natural cave with two open ends. The spot is situated on a remote edge of Hiregudda plateau. Its is small group of caves huddled together forming a comfortable place for human settlement. In fact this spot is a confirmed prehistoric site. In the cave's roof is an opening which is said have caused when lightening struck. Kutkankeri - group of hills is a confirmed prehistoric site. The hill known for its rick formations, rock-shelters, rock paintings depicting animals and human forms and ancient shrines. One of the largest paintings here depicts Indian striped hyena. Also, on this hill is a cavern which is said to be occupied by hyenas. Once can easily spend half day exploring the hill. Mahakoota - is a group of small temples around a natural spring built during Chalukyan times. The temples are dedicated to Shivalinga and Nandi. The pond of clear spring water is said to have medicinal properties. 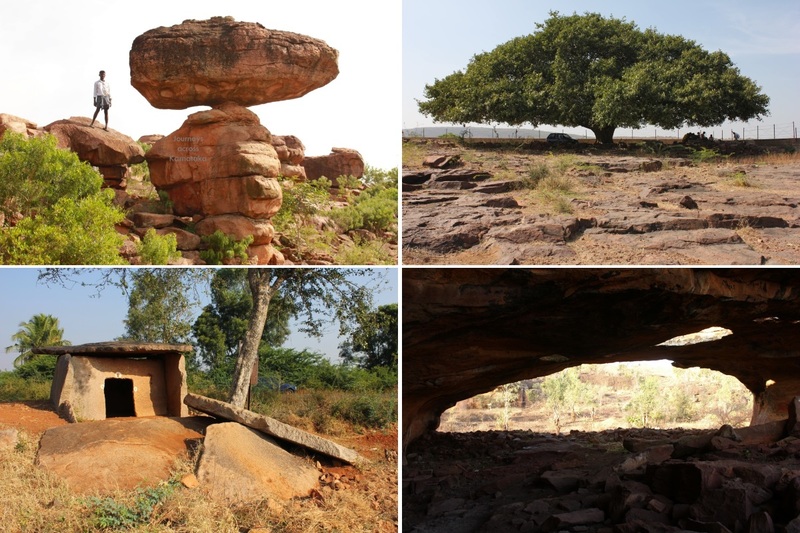 This place is about 15 kms from Badami. Halae Mahakoota - is the older version of Mahakoota; it is situated nearby Mahakoota. Shivayogi Mandira - is a Lingayath monastery situated on the left bank of river Malaprabha. The monastery is known for its collection of rare Talegari Lipi (ancient leaf inscriptions). Bachingudda - a prehistoric site on the left bank of river Malaprabha. The site is situated on a hillock where remains of an temple was discovered. Also, close to the hill, on the plains are two ancient megalithic tombs. 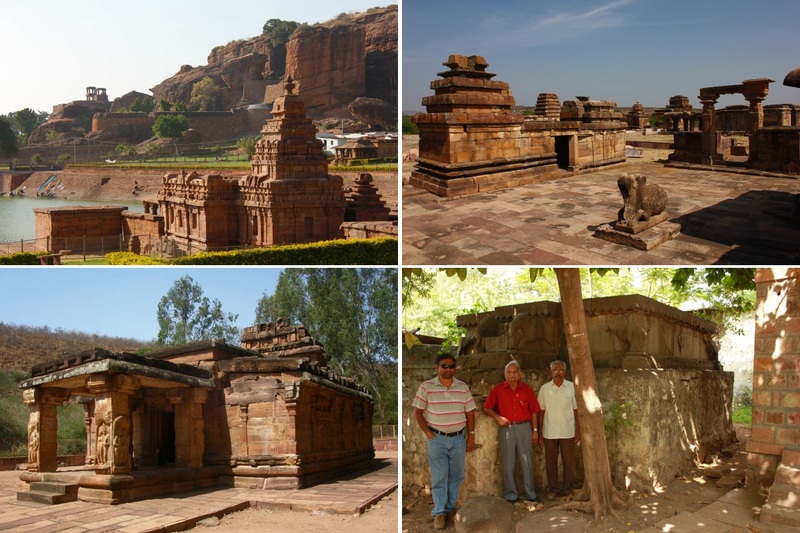 The tombs are located right besides Pattadakal-Badami road, about 2 kilometers from Pattadakal. Huligyammana Kolla - is an ancient shrine in a rock shelter. One can see small temples of Chalukyan time. Pattadakal - is one among the fifteen World Heritage Sites of India. While Aihole is considered as school of temple building, Pattadakal is considered as the college. It is said that ...Chalukyan kings would come here for Pattabhisheka (coronation) hence the name Pattadakal. The place is situated on the left bank of Malaprabha, the river flows in south-north direction here. Siddana Kolla - is an ancient shrine in a rock cleft. Here is a west-facing temple dedicated to Shiva Linga. The spot is situated in the path of a stream which flowed through out the year centuries ago. However, in the present day, the stream is alive only during rainy season. Aihole - probably one of the longest inhabited place in Karnataka. Situated on the right bank of river Malaprabha, the village has more than 100 temples of various sizes and forms. Aihole is said to be the place where temple building technology evolved, hence its is called as the cradle of temple building. The most popular being the Durga Temple Complex; within this complex are temples of various designs. The other spots are Ravanapadi rock-cut temple, Jyotirlinga temple complex, Mallikarjuna temple complex, Buddhist Charityalaya, Meguti temple,Boyar Gudi, Ancient quarry site, Rock-cut Jain Basadi, Prehistroic burial chambers, Galaganatha temple complex and Ramlingeshwara temple complex. The place has so much to see, one can easily spend two days here. 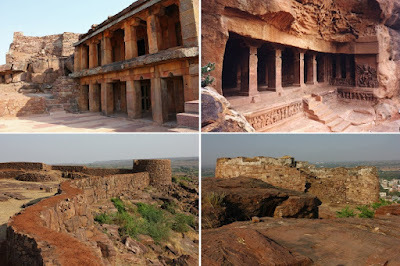 Akkargal fort - is a small fort situated on a rocky hillock on the left bank of river Malaprabha, in between Pattadakal and Aihole. Close to this fort is a small temple dedicate to Durgadevi, but locally known as Maliyavvana Gudi. Shankarlingeshwara temple at Motar Maradi - is an unusual structure built into small rock formation. Also close by two smaller temples, all built during Chalukyan times. It seems these temples were experiments in temple construction technology. Maliyavvana Gudi - is a small but beautiful temple situated besides a pond. The temple seems to be a scale model before commencing the actual project. The temple is dedicated to Durgadevi. The idol depicts an ideal female form.. slender body with narrow waist, large breasts and log limbs. The name Maliyavva derives from the Kannada word.. Mali for breasts. Kelur fort - a small fort on a hillock probably built by Maratha rulers. Probably, 500 years old, the fort's bastions have withstood the test of time. Chikanal fort - a small fort on a hillock near Gudur. This is in complete ruins and neglected. Gudur fort - a small fort on a rocky hillock close to Chikanal. In elevation, this fort is higher and part of the long hill range. Arshibeedu temples - these temples are about 4 kms from Gudur on Gudur-Hanamasagar road; situated on slopes of a hillock. The temples are built during Chalukyan king These temples were built by King Adivikramaditya of Kalyana Chalukya dynasty. During his reign Arshibidu was a vice-capital known by the name Vikramapura. Kudala Sangama - The confluence of Krishna and Malaprabha. At this spot is Sangameshwara temple which was often visited by the Lingayath Saint Basaveshwara. The Aikya Mantapa where Basaveshwara attains Samadhi is situated at the confluence is now enclosed in a concrete well to prevent it from submerging in the waters of Basava Sagar. Bilagi - or Bilgi is a religious spot with a long history. It is situated on Bijapur-Bagalkot road. Here is a pond called Arettina Bavi (six bullock well) which has a shrine inside dedicated to Mahadeva. Also in the well are stone inscriptions in Kannada, Marathi and Persian. it is said the well was built in the year 1708 CE. Elephant Tomb, Galgali - Galgali is a village situated on the banks of river Krishna. In the village is a tomb of an elephant belonging to Aurangzeb, the Mughal emperor. Belur fort - a fort on a hillock near Banashankari. This is one of the seven hill forts built by Maratha rulers. It is said that fire signals were used to convey messages between the forts. Rameshwara temple, Jamkhandi - commonly known as Ramtheerth is situated on Jamkhandi hill. It is said that Rama, Sita and Laxmana had visited this place during their Vanavasa. The temple is said to be built during Chalukyan times. Rajwade Patawardhan Palace, Jamkhandi - a palace on the hill close to the Rameshwara Temple. It was built by Ramchandrarao Gopalrao Patwardhan during the second half of XIX Century. The palace has amenities like electric lift, swimming pool and also had a theater with a stage. None of the family members reside here, the palace is an theater is in ruins. Bagalkot and Koppal districts are like twin brothers, equally rich in historic and prehistoric spots. One can spend months here and yet miss something. Thank you for your wonderful work on this website. I'm a french traveller in love with India (13 trips since 10 years). I am planning the next trip in north Karnataka and your site is very helpfull. Thanks again for all these historical and architectural détails, photos and stories. My problem now is to choose. .. So many interesting places ! 13 trips in 10 years in truly amazing! You are always welcome and you picked the right place to see. You must check out wonders of Bagalkot district and Koppal district as well.